Two burial services have taken place on the Western Front honouring four unknown Irish soldiers who fell during the First World War. 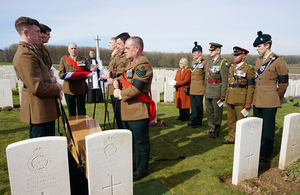 The first service took place at the Commonwealth War Graves Commission’s (CWGC) Messines Ridge British Cemetery near Ypres, Belgium on Tuesday 19 March with a second burial taking place earlier today (Wednesday 20 March) at Guillemont Road Cemetery, on the Somme in France. It has been a privilege to organise these two services and to work with The Royal Irish Regiment to ensure these Irish soldiers have had the burial they deserve. Although their identities remain unknown, they are now at rest alongside their comrades and their sacrifices will not be forgotten. 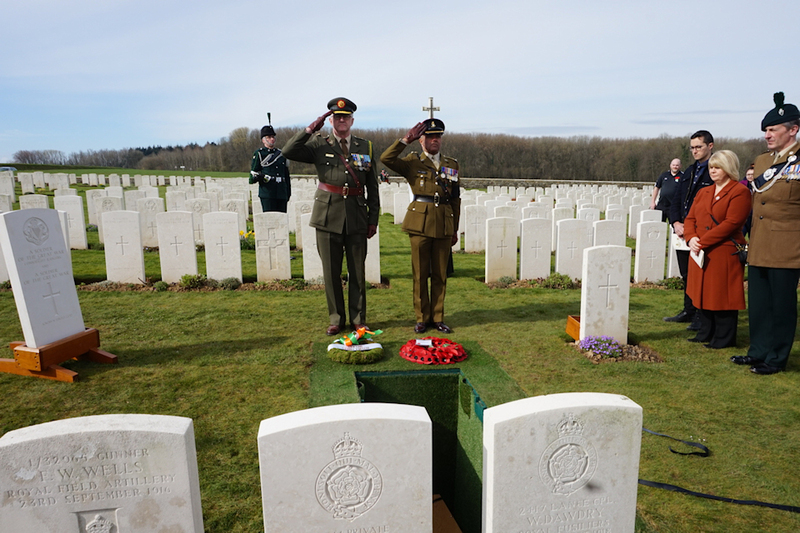 A second burial service took place today (20 March) for a soldier of The Connaught Rangers and an unknown soldier of an unknown regiment at Guillemont Road Cemetery. The remains of these two soldiers had been uncovered during work on a wind turbine project near the village of Guillemont. They are believed to have been killed in September 1916. For our services of burial, we have commended the treasured remains of soldiers lost in conflicts of the First World War. These are moving events and reaffirm the loss incurred in conflict, for those killed and the sense of loss suffered by family members. Although soldiers die, some of them unknown, their lives are celebrated here, and their souls offered to God, as held in the beliefs of the Christian faith. People are never forgotten, and their lives honoured. Although it has not been possible to identify these four soldiers, their service and sacrifice has not been forgotten. They have been laid to rest with respect and dignity alongside their comrades in Messines Ridge British Cemetery and Guillemont Road Cemetery. The Commonwealth War Graves Commission will proudly mark and care for their graves, together with all of those who served and fell, in perpetuity.